Would you like the complete christmas package. Hire our Christmas themed tables, our christmas backdrop, our fabulous christmas banners and uplighters. Your guests can enjoy the full christmas experience with christmas themeing from A K Casino Knights. 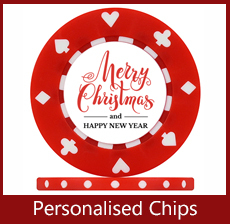 Personalised chips are available for all of your gusts to keep and personalised christmas fun money! Put the boos on their very own bank note!